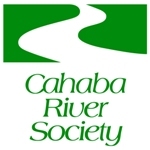 Our mission is to restore and protect the Cahaba River watershed and its rich diversity of life. The Cahaba River has more species of fish per mile than any other river in North America and is considered to be nationally and globally significant for freshwater biodiversity by conservation groups such as The Nature Conservancy and The World Wildlife Fund.  Click on the logo to enter the site.